HostUpon Review 2019 - Top In House Support and Low Prices, 50% OFF! The websites we tested performed well consistently. Down time is very little concern. Servers are stable compared to others. Support is very efficient, multi-lingual, and live chat is fast. Very affordable to get started and renewals are industry standard pricing. HostUpon, a Canadian Web hosting company, based out of Toronto, Ontario, has been the choice hosting provider for thousands of website owners across the globe but especially for Canadians. 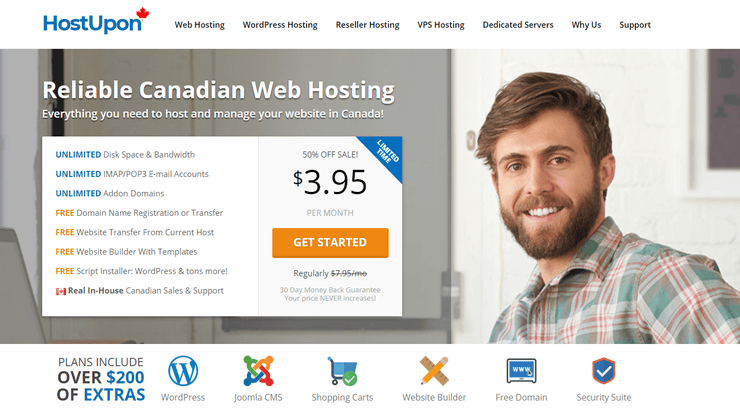 By maintaining high standards of customer service and an always-online support team, this Canadian web host provides cost-effective solutions without going cheap. Multiple Datacenter locations (Toronto Canada, Seattle Washington, & Dallas Texas, USA) - With data centers distributed in key locations across the globe you can be sure your website will perform well regardless of your geographic location. Free Domain Registration/Domain Transfer - Offering free domain names with the purchase of a web hosting account has really become the norm but we are happy to see HostUpon see the value to customers and offers this as well. Free Site Migrations - We like to see web hosting companies go above and beyond to help people with difficult tasks like migrating a website. If you are considering switching to HostUpon from another host even if that host is not Canadian you will be in good hands. Support for Unlimited MYSQL Databases and Email Accounts - Most websites won't use more than one or two databases and less than a dozen email addresses but if you need more HostUpon has you covered. Website Builder - Most people are building their sites with WordPress but for the newbies who want something extremely simple HostUpon throws in a website builder option. 30-day money back guarantee - Thirty days has become the industry standard in the US and now the same with Canada so if you are not satisfied with their service you have a full month to make a decision and they will refund your card if you are not happy. Local Servers But What About CAD? Not a bad choice for Canadians who are looking to host their website in the country but they don't offer the ability to pay in CAD which is something to consider. All-in-all HostUpon is a good choice for hosting your personal or small business website if you're in Canada. HostUpon ensures an equal opportunity for success on their platform by giving their customers access to many starting benefits and peace of mind features. In the event of an issue, a 100% in-house support team means quick, responsive technical support to handle any hiccups, making HostUpon a cut above their Canada based web hosting competition. The majority of the Web hosts in their price range tend to outsource support with the goal of pacifying customers instead of resolving issues. HostUpon establishes a clear declaration of providing affordable web hosting without cutting those corners. HostUpon also provides a robust knowledge base and access multiple written and video tutorials for those DIY customers out there that would rather fix it themselves than rely on the support team to make all that necessary changes. Always eager to help and provide assistance, support agents are available 24/7/365, through a live chat and email ticketing system and by phone between 9am-5pm EST. Unique for a Web hosting company, HostUpon also pushes for eco-friendly, green initiatives in their offices and data centers by selecting energy-efficient hardware and office appliances. 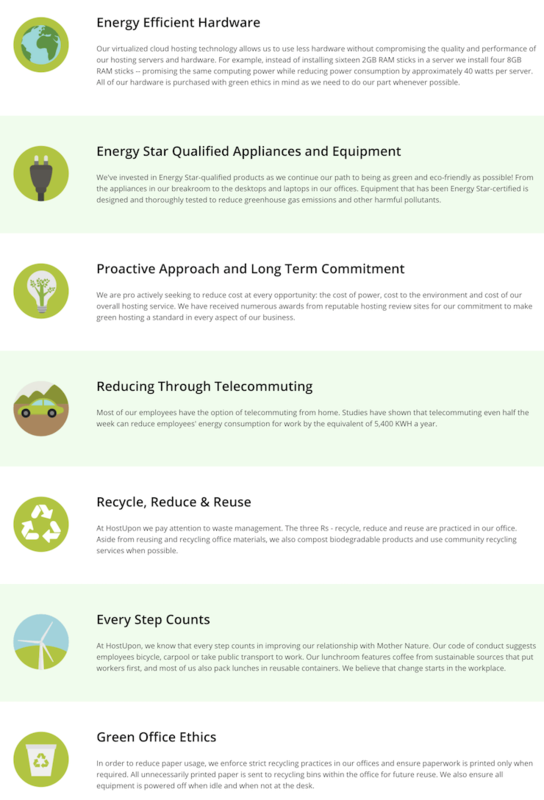 They continue to encourage this mentality in their employees by offering telecommuting options, green-minded office practices, and to utilize community recycling services when possible. This focus on being eco-friendly comes at quite the shock considering their price points stay competitive with other US web hosting companies that do not share that focus. From Shared and Cloud Hosting options to powerful Dedicated Servers, this web host offers a variety of products and services to match their customer's needs. In addition to the hosting services, they also offer supporting products like domain name registration, backup services, and SSL certificates. HostUpon has priced their Shared Hosting Plans to remain effective in a highly competitive market. Extending beyond local web hosting companies, HostUpon has managed to offer prices for their Shared plans that can compete with much larger, US-based hosting companies. This gives them an effective edge as the price point brings in the wandering customers and the stellar customer service keeps them on board. 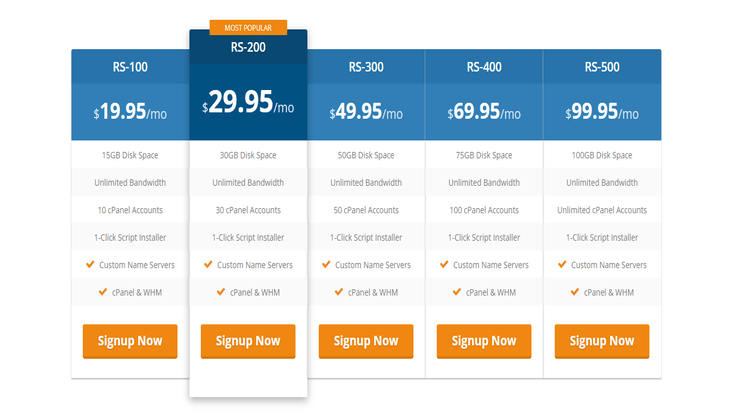 Starting at $3.95/mo the Starter Unlimited plan provides many useful features like Unlimited Bandwidth, mysql databases, email accounts, and addon domains. 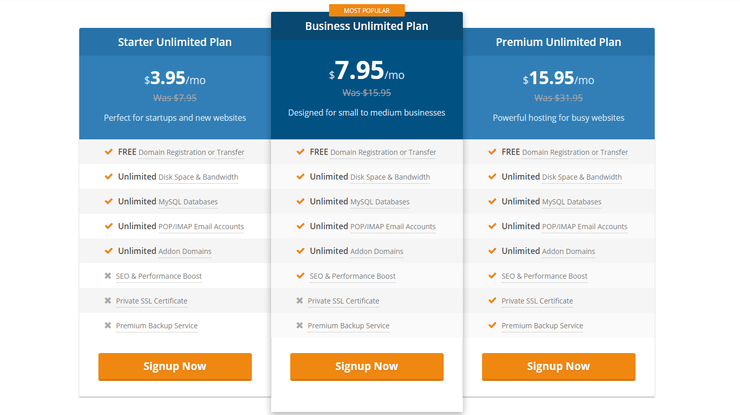 The Business Unlimited plan offers the same plus access to SEO features and performance boost. Premium Business Unlimited plan builds off of the Business plan by adding access to the premium backup service. The premium backup service allows for further control over restoration request, down to the file level. The HostUpon Shared Hosting plan is listed in 3 tiers; Starter, Business, and Premium Business. Getting started in running your own hosting business can be an expensive startup. Many Web Hosting companies have found that offering their existing shared plan infrastructure for their customers to resell or be utilized by a web designer or digital marketer offers another avenue of clientele. HostUpon encourages this business model through the use of its Reseller hosting plans. Categorized into 5 tiers, ranging from the least expensive, RS-100, to the most expensive, feature-filled option, RS-500, these plans offer a variety of options and a seamless upgrade path as the reseller's business continues to grow. Among multiple hosting providers, reseller plans tend to be rather run-of-the-mill, with many useful features locked behind red tape that keeps the reseller's control of the customer environment minimalized. HostUpon offers some features by default that are not typical for reseller plans of other web hosts. Offering a 100% White label platform, out of the gate, and allowing for access to the supporting firewall systems, like CSF and LFD, see the HostUpon reseller plans standing out from the pack. As the names indicate, a Shared Hosting plan allows for multiple sites owned by multiple customers to share the same server. A VPS (Virtual Private Server) is an entire server that is reserved for a single customer. The VPS is private to that customer and their sites alone meaning they are not sharing any of those resources (CPU, RAM, DISK) with other clients. When deep control of a server environment is needed a VPS is an excellent step in that direction and HostUpon provide fantastic support to ensure a transition to one of their VPS handled smoothly. HostUpon pre-installs a cPanel/WHM template that includes: PHP, MySQL, Apache, CSF firewall, and Mod_security on a CentOS Operating System. These Plans are also scalable, meaning you can adjust the resources on the fly by reaching out to the HostUpon sales team. With no downtime involved and an estimated 30 second for resources to be ready, the upgrade process is seamless and efficient. Dedicated Server hosting from HostUpon provides complete control over the server down to the hardware itself. This is not a virtual server is an actual IBM server blade in a stack at one of their data center locations. HostUpon provides cPanel/WHM template similar to their VPS's pre-installation template so that new server owner can hit the ground running. These servers are also scalable but downtime can be required as these servers are dedicated hardware server blades and require a data center technician to complete the upgrades. 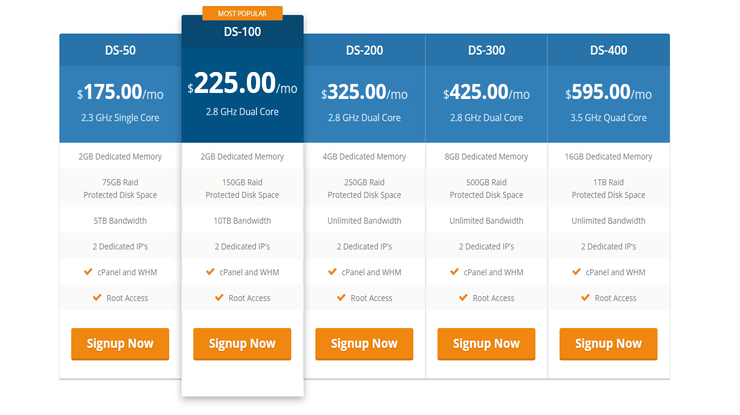 Starting with the DS-50 at $175.00/mo, HostUpon offers 5 tiers of Dedicated Server plans. Each upgrade adding additional RAM, Disk Space (in Raid), and Bandwidth. Cloud hosting plans offered by HostUpon are designed with redundancy in mind by having a single website load from multiple servers. This means that these plan options are intended for higher availability web applications and websites. These plans are fully scalable allowing customers to upgrade and downgrade reactively. 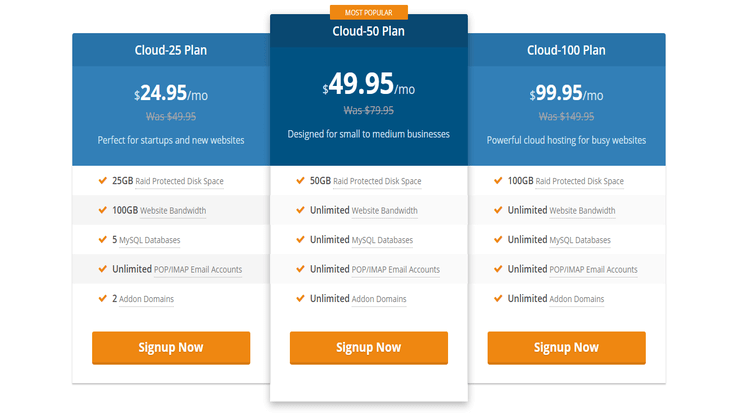 HostUpon provides 3 tiers of Cloud Hosting plans starting with the Cloud-25 at $24.95/mo which is the most restricted of the three plans. It's probably better to upgrade to the next tier as the plan benefits of the Cloud-50 scale up to multiple unlimited features. In this HostUpon review, we found their affordable price points and their Canadian based support are popular contributing factors to their success cited multiple through testimonials and end-user experiences. From an end-user perspective, the site navigation itself is rather intuitive and I didn't find my itself areas of their website that left lost or confused. I had also found their breakdown and explanation of individual products and services they offer was expressed in a way that a professional webmaster or new website owner could feel comfortable with a product introduction. That attention detail speaks volumes about their core customer philosophy as many web hosting providers will assume that knowledge leaving new website owners scratching their heads. While I am not a big fan of utilizing the "Unlimited" phrasing for disk space usage in Shared Hosting plans, I understand that this is a competitive statement as other web Hosts will make the same claim. I also found that it was rather strange that the Cloud hosting service was buried in the site's footer. A few minor grievances aside, HostUpon as demonstrated that they are a Web Host capable of providing reliable, local support for their customers while remaining competitive with other hosting companies. In today's climate, web hosts are a dime-a-dozen. But, in that sea mediocrity, we do have outliers that build their businesses around great Canada based customer service and effective technical support, without breaking the bank.